56? Hey, 560 Khz was the frequency for several great radio stations. There was WFIL in the Cradle Of Liberty ("Famous Fifty Six"), Wonderful WQAM in Miami, Gone With The WIND in Chicago, and of course, The World's Greatest Radio Station, KSFO in San Francisco. But for the purpose of this exhibit, 56 is the age of your curator as of Monday, January 8, 2007. It is also the birthday of Elvis Presley, David Bowie, Yvette Mimieux, John A. Gambling, Bob Eubanks, Charles Osgood, Soupy Sales and Butterfly McQueen. Like Butterfly, I don't know nothin' about birthin' no babies  so I'm offering another aircheck of my early radio adventure. Later, I got off the air, which was a good thing for radio listeners everywhere.
. . . Your guy R.I. on the radio . 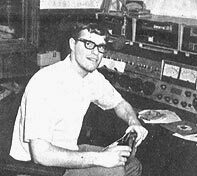 . .
Richard Irwin (aka Uncle Ricky) in the WIXE control room, 1968. The console was a 10-channel Gates Diplomat. There were 4 ATC tape cartridge decks over the console, and 3 QRK turntables to the left. Mom passed away in November of 2006, and I found this half-track, 3-3/4 ips tape when cleaning out her house in December, 2006. To the best of my memory, it was recorded with a timer at my home in Concord, N.C., about 30 miles north of 500-watt WIXE in Monroe, N.C. I used a 1940's-era Hallicrafters receiver and a 1960's-era Lafayette Electronics consumer tape deck. I do wish the fidelity on this was better. It's a bit gritty. Of course, I was excited to hear 40-something minutes of a 37-year-old radio show that I didn't even remember recording. I was 18 years old in March 1969, just about to graduate from Concord High School, and Wonderful WIXE was the coolest thing imaginable - less than a year old, with almost new gear, and "Brother" Dave Hedrick, the extra-cool GM and PD who first exposed me to airchecks, jingles, and the radio I can't forget. You'll hear Gwinsound jingles, "accent" reverb, the WIXE time-tone and a great mix of 1969 southeastern Top40. Brother Dave appears on many of the spots, and you'll also hear me being a total jerk, talking over the spots. You'll hear Ray Cook on a spot, Hayne Davis on promos, and J. Frank Coley with news. A jingle or ID before, after and between EVERY program element - that was the format (somewhat like Hot Hits years later.) I was lucky to be there, a high-school kid with big dreams. Many talented people worked at WIXE, including Doug Limerick (ABC News) and Larry Dixon (WAPE, KVIL). Reel Top 40 Radio Repository ©1996-2007 REELRADIO, Inc.